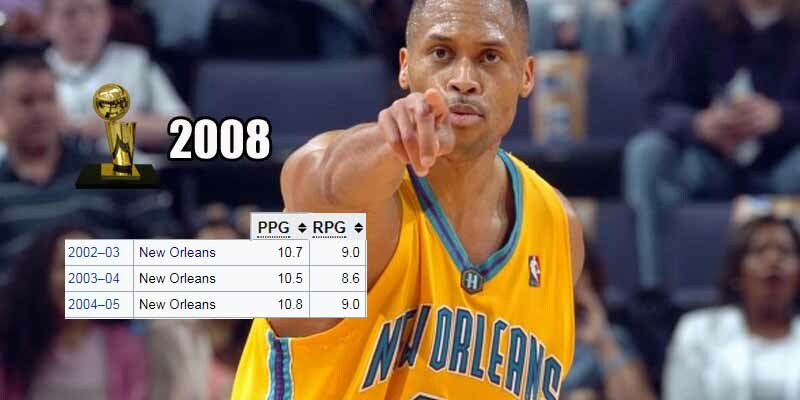 PJ Brown was solid contributor to the original Chralotte/New Orleans Hornets at the starting PF spot, playing from 2000 to 2006. He would average better than 10 points per game for three consecutive seasons and would even average a career high of 10 boards per in the 2001-02 season. He was also a relatively efficient scorer, peaking at 53% with plenty of mid-range game in 2002-3. He was also solid on the defensive end with 3 All-Defensive Second Team Appearances, one of them with New Orleans. He was also part of the 2007-8 Celtics squad that won the championship.